The fight started slowly with little thrown in the first 30 seconds though the fight started to heat up and after a minute both were taking it in turns to fire off shots. Unfortunately for the Brazilian his shots didn't have the power or accuracy to make Murata respect him whilst Murata's shots seemed to shake Nascimento almost every time they landed. Worryingly for Nascimento it was clear Murata was merely fighting in first gear. He was cruising through the opening round and trying to see Nascimento really had and whether the Brazilian was as much of a puncher as his reputation indicated. The second round of the fight looked like a public sparring exhibition from Murata who put his foot on the gas slightly and started to punch Nascimento around the ring. By the early stages of round 3 it seemed clear that Nascimento was getting beaten down and Murata could feel it as he began to unload shots at will on Nascimento who was eventually dropped. Despite Nascimento having managed to see out the third round the ending seemed inevitable and a follow up attack early in round 4 forced the referee to step in and wave it off. By the point of the stoppage it had began to look like Nascimento was little more than a human punch bag taking big shots with out throwing anything back at all. Although Murata had travelled from Japan he did seem to have a huge following in Macau and got huge cheers at both the start and end of his fight. We're going to assume that they were Japanese fans who followed Murata over to Macau showing just how big his draw is even at this early stage of his career. Earlier today all the fighters on the "Ring of Gold" card were paraded in front of the press ahead of the big show this coming Sunday. 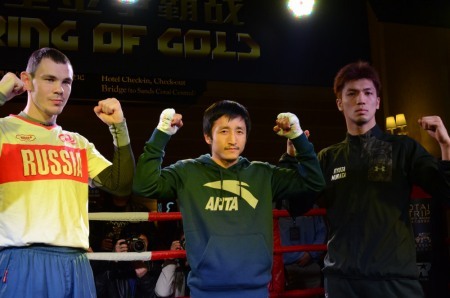 Amongst those on show were Olympic gold medal winning trio Egor Mekhontsev, Zou Shiming and Ryota Murata, pictured, Denis Shafikov, Rex Tso, Kuok Kun Ng and Akifumi Shimoda. It seems that all the fighters have made it over well and look in fine condition ahead of their fights though a few final touches will be put to their preparation as will very light training. The key for the next few days will be to make sure they weigh in correctly and that they've adapted to the conditions. It'd be a shock if any of them did fail to make weight though we did hear that the contracted weight for Murata's fight with Carlos Nascimento has been increased slightly from the originally contracted weight. Odds for "Ring of Gold"
Today, for the first time, we've seen odds for much of the "Ring of Gold" card published. The one bout that had been priced up for a while was the IBF Lightweight world title fight between Miguel Vazquez (33-3, 13) and Denis Shafikov (33-0-1, 18). This bout had been priced for a few weeks and saw Shafikov open at around 9/4, his odds have now shortened to just 6/4 leaving him a small under-dog. Vazquez, the betting favourite, is currently 4/6 though was much shorter a week or two back. We had predicted a victory for Shafikov and Taka's tip was for Shafikov when he was 9/4, at the closer odds however the bout is priced much more accurately than it was originally. The next closest bout on the card is the WBO International Featherweight title bout between Akifumi Shimoda (28-3-2, 12) and Marvin Sonsona (17-1-1, 14). Shimoda, of Japan, has been instilled as a notable favourite priced at 1/2 though Sonsona is nicely priced at 7/4 if you like the upset. We do view this as a pretty even bout so could see some punters lean towards Sonsona who does, as we said, look nice priced. Unfortunately it's only really those two bouts which are even competitive looking on the books, though they do carry 3 other bouts. Japanese star Ryota Murata (2-0, 2) is set as a clear 1/12 favourite against Brazilian puncher Carlos Nascimento (29-3, 23) who is 8/1. There are no odds currently available on this one ending by stoppage though that is what we're expecting. China's very own Zou Shiming (3-0) is an unbackable 1/33 favourite to beat Thailand's Yokthong Kokietgym (15-3, 11). Although more experienced as a professional Yokthong is the big the underdog priced at 10/1 and we'd not be that shocked to see one or two people a nibble at that. The only other bout priced at the moment is that of the "Wonder Boy" Rex Tso (11-0, 7) who is a clear favourite priced at 1/18. Although we weren't impressed by Tso the first time we saw him fight in Macau, struggling to hold a majority decision over Rusalee Samor, he should really have more than enough for Mako Matsuyama (7-7-1, 3) who is a big underdog at 17/2. Although a lot of the bouts are mismatches we have certainly seen some value in there and placed our own personal bets. The most interesting of which features Shafikov, Sonsona, Murata, Yokthong and Tso in an accumulator and trust us, if that wins drinks are them! *Please note-All odds are correct at time of writing, all odds are win only and all odds are available on UK betting websites. We are not advocating gambling but merely using the odds to demonstrate who is the favourite and how much of a favourite they are. All bets are at a risk and are taken at the individuals own choice we are not advocating gambling and it is addictive.